Q: What did i need to watch Streams or Videos with VLC Media Player? A: To watch/record Streams and Online Videos with VLC Mediaplayer you need following components. Q: Which Stream or Videoprovider can i view with VLC Player and the GUI? Q: Which Mediayplayer could i use to watch Streams? Q: Why is a path to browser required? Which browser i could use? A: The Browser is required to open the game favorites and the chat window when option 'Chat' is selected. Every installed browser could be used for that. Q: How i can add a game to the 'My Games' favorite list? A: Watch this Tutorial to learn how to add game favorites. Q: Is it possible to add an additional description to an entry in favorite list? A: Yes. With CTRL+ALT 8,9 you can make square brackets [ ] to add a description. As example: [Tutorial]8q4Q-nzXTbE or 8q4Q-nzXTbE[Tutorial] illustration here. Q: Why i got the Message 'error: No streams found on this URL ' although the Stream is already broadcasting? A: In many cases (like Vaughn Live, Afreeca) the problem is mostly an old plugin for Livestreamer or Streamlink. Visit this page to learn how to update plugins. F: I got the error '[Errno 1] _ssl.c:504: error:14092073:SSL routines:SSL3_GET_SERVER_HELLO:bad packet length' eg. 'error: No streams found on this URL' at Chaturbate. A: Since a change at Chaturbate it's required to use Streamlink instead Livestreamer. Open the download page and download the Complete Package with Streamlink. After that select in GUI streamlink.exe instead livestreamer.exe in tab settings. Q: How i can choose a stream quality, which is not in Dropdown Menue? A: Just type in the Dropdown field the available stream or video quality. As example: source, source_http, 1080p60, 360p etc. Q: Why i got the Error 'Stream is offline' although the Stream is already broadcasting? A: Please have attention to the correct setting from the source and the ID. F: How is recording with Online Check (OCR) work? A: For this function a free key is required. By clicking 'Create key' in GUI, a page will open where you can create the key. The query of the status of a stream is only possible for platforms in the dropdown menu. In the ID field only the channel name has to be entered. Url addresses like http:// or www. are not valid! 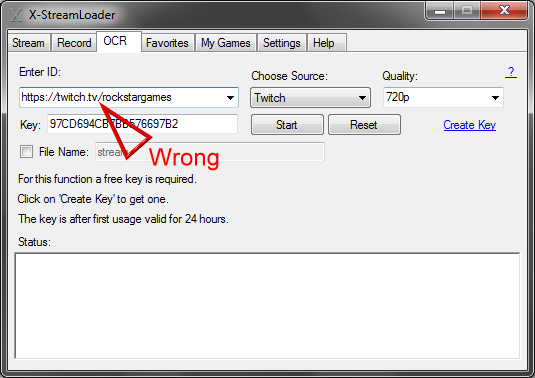 To record a live stream from Gaming Youtube with OCR, it's required to enter the channelname into ID field. To record a live stream from Youtube Live with OCR, it's required to enter the channelname into ID field. Q: Why i got at Afreeca.com the Error 'Stream is offline' although the Stream is already broadcasting? 1. Navigate to your Livestreamer folder e.g. 2. Open the file afreeca.py with a Texteditor. 4. Save the file. Afreeca.com streams should work now. Have also attention to the correct input in the ID field. Q: I already have installed Livestreamer/Streamlink and RTMPDump. Is it nevertheless required to download the Complete Package? A: No. You can use your installed programs very well. You only need the X-StreamLoader GUI. Q: When i want record it just open shortly a Command Window and that closed immediately. What's the problem? Q: Is it possible to update Livestreamer and RTMPDump which are included in complete package? A: Yes. Visit the official Website from Livestreamer, RTMPDump. Download the latest version and replace it. Q: Im using youtube-dl to download Youtube videos. Is it possible to update the program with the GUI? If command window closes immediately, youtube-dl is up to date. 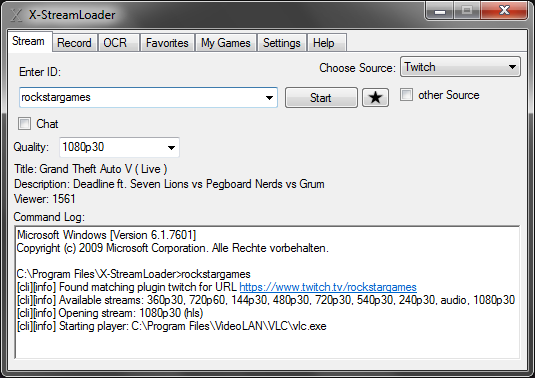 Q: I would update the X-StreamLoader GUI. Did i also must replace the config.ini and xstreamloaderrc file? A: No. Just extract the files and replace X-StreamLoader.exe with the existing file in your folder. Q: When i use Livestreamer/Streamlink with the command line, it's possible to add options in the livestreamerrc/streamlinkrc file. Did i also have this possibility when using the GUI? A: Yes. 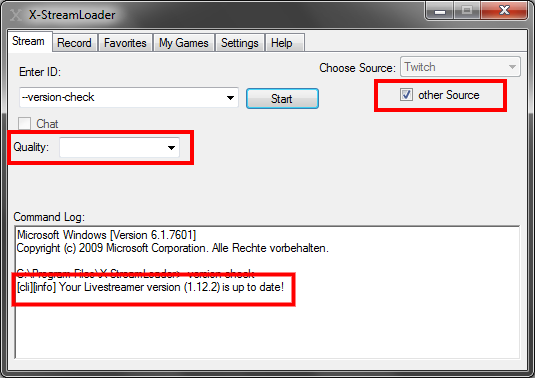 If you want add more options for Livestreamer/Streamlink, activate the Checkbox 'Load livestreamerrc' in Tab 'Settings'. After that it's possible to use options in the livestreamerrc file. The file must be in the same folder as X-StreamLoader.exe is located. In current version these options could also be added to xstreamloaderrc file. This file is loaded automatically. Q: Is it possible to send commands to Livestreamer/Streamlink with the GUI? A: Yes. Enter the command in the ID field. Select 'other Source'. Left the quality field blank and click start. 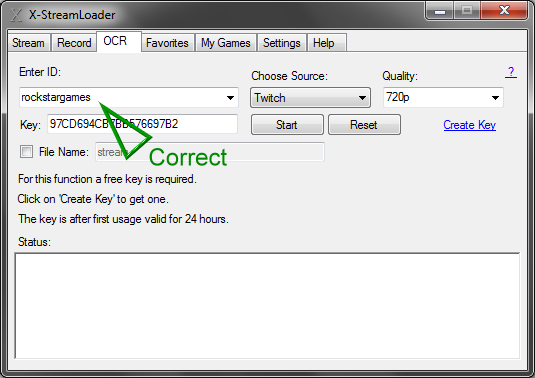 A: To further watch Twitch Streams with Livestreamer it's required to add a Client ID into the xstreamloaderrc file, which is located in X-StreamLoader mainfolder. *The Error can also be fixed with an Access-Token.